The DAT grades you on 6 different subjects on a standard scale out of 30 points. The average test taker will score a 17 (50th percentile). The average for acceptance is a 19-20AA (~85th percentile). This is just an average though, a quick look at the ADEA Guide to Dental Schools shows that students get accepted with lower scores as well! Many schools also have cutoffs for minimum DAT scores. Each school has a different cutoff, and some have no cutoff. I know of one student who was accepted to the University of Florida with a 14 in QR, on the condition that he retake the DAT and score at least a 15 in each section to meet their cutoff. Talk about pressure! You can read more about the scoring method of the DAT on the ADA’s official website. How Many Questions Do I Need To Answer Correctly To Get a 20? Generally speaking, you can only miss around 5-6 questions in each of the science and math sections to score a 20. Scores of over 23 are very rare (98th percentile and up). You can miss around 20 questions in the perceptual test to score a 20. And lastly, you can miss around 10 questions in the reading comprehension section to get a 20. 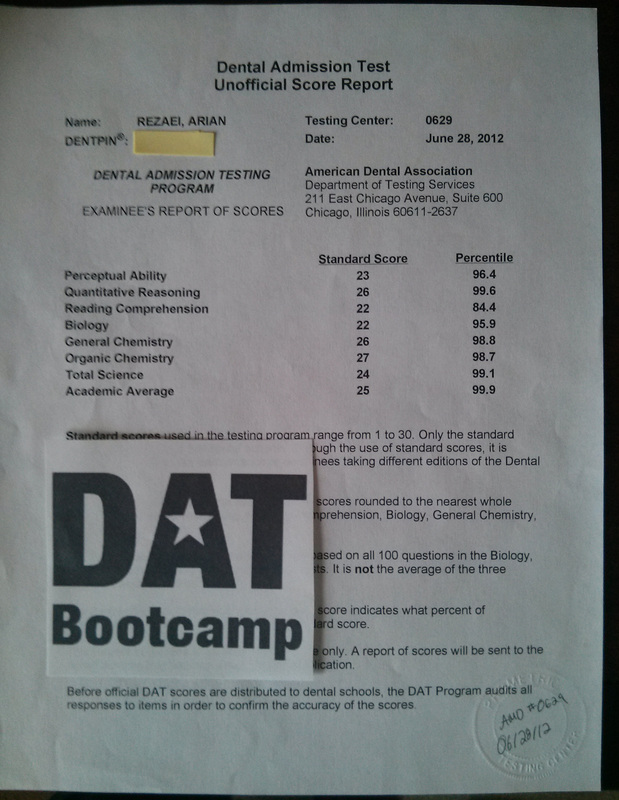 **Note: DAT Bootcamp uses our own scoring system. Each test is calibrated differently according to its difficulty. You can’t just fit a one size fits all chart to all practice exams that comprise of 30 science questions to get accurate results. What’s more important though is the review of the questions. ALWAYS review all of the questions you did not immediately know the answer to (or how to go about solving). This is what will help you score higher, don’t take comfort with higher scores or get nervous with lower scores. As you can see, there isn’t much room for error on the DAT. In addition, you don’t have a lot of time either for each question. You have to know how to get to the correct answer and the fastest way to get there. Knowing the material is only part of the battle, you also have to be good at taking the DAT. By doing DAT practice tests, you can work on both your knowledge of the material and the conditions of the testing environment (computer-based, timed, unique wording of questions, etc. ).